The smooth, deep voice fills and warms the empty church sanctuary. Seated on a wooden stool on the stage, Dane Bailey belts out one song after another as upbeat Southern Gospel music bounces from the portable sound system. It’s only a rehearsal, but Bailey, “The Singing Auctioneer,” is having as much fun as if he’s playing to a packed house. “It’s exciting to be full-time in the ministry,” said Bailey, 58, of Fort Wayne, who had sung gospel music part time for 26 years before devoting his full energy to it three years ago. A Berne native, Bailey grew up singing at Bethel Brethren Church in Berne, and in his high school choir. He went on to pursue a degree in engineering at Tri-State University in Angola, graduating in 1968. He had moved back to Berne and was working there in 1969 when the pastor’s sermon one day triggered the feeling he was being called to ministry. The problem was, Bailey didn’t feel called to lead a congregation as a pastor. To sort things out, he moved his family that year to Winona Lake with the idea of enrolling at Grace Theological Seminary. He also took an engineering job with orthopedics manufacturer Zimmer in Warsaw, and he didn’t make it to the seminary until 1975. “I took a long time to get there, but I never lost the call or the vision,” Bailey said. While at the seminary, he met a fellow student who played piano. The two began performing together, even traveling a little for two years to put on concerts. Bailey had found his ministry calling. 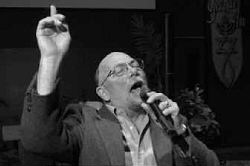 He began singing gospel on a part-time basis, performing at church services and events, concerts, and festivals in his spare time. He made his living for 20 of those years as a heating-and-air conditioning service technician. In 1990, the business he worked for was closing, so he went to school to learn how to be an auctioneer. He was a natural. He already had the big voice. He was used to being in front of crowds and doing a little entertaining. He worked regularly at auctions in Shipshewana and Nappanee for a few years. He also is part owner of Martin & Bailey Auction-Realty in Fort Wayne. Bailey since has made the 1950s hit “The Auctioneer” one of his signature songs. He works the yodeling vocals of auction calling into many of his gospel songs. The auctioneering experience also has opened another door for him – benefit auctions. The combination of singing and auctioneering started filling his schedule. Three years ago, with the blessings of his wife, Christina, he went into gospel singing full time. His concert schedule has more than doubled to 110 performances this year from 50 three years ago. Since going full-time, he also has put out three compact discs of songs, including “The Sketch” earlier this year. The new CD’s title song, a ballad about God’s love, is the first Bailey has written himself. He also handles all his own booking, promotion and concert set-up and tear-down. Shows take him around the Midwest, as well as to eastern and southern states. Performing and traveling make for some long days. But any weariness disappears when Bailey takes the stage. He usually starts performances with a few upbeat songs and before bid-calling his way into “The Auctioneer.” He then sings a few ballads offering personal testimony about his Christian beliefs. The song describes all the people who find salvation after a squirrel gets loose in the sanctuary and runs up the pant leg and then the dress of two of the stodgier members of the congregation. “Dane has a lot of personality,” said the Rev. Joe Nass, pastor of Bethel Brethren in Berne, where Bailey has performed a few times. “He puts that into the presentation, too. For Bailey, the reward comes not only from seeing smiling faces grinning back at him from his audiences. “We want to reach out and touch the heart,” he said. Dane Bailey, “The Singing Auctioneer,” will sing during worship services at 8:15, 9:45 and 11:15 a.m. Oct. 24 at Emmanuel Community Church, 12222 W. U.S. 24 in Fort Wayne. Dane Bailey brings a delightful sense of humor, his rich vocals and obvious surrender to Jesus Christ to each appearance. In a variety of worship, inspirational and entertainment settings, Dane effectively communicated to Youth for Christ ministry partners at Investor Banquets and to community supporters at YFC golf benefit events. I trust him! I appreciate Dane's servant-hearted willingness to blend his powerful concert talents with the goals of our programming needs. HE'S THE REAL DEAL. Dane - Thank you - for stuff - even stuff you don't know about! You're a man of God, willing to auction off anything but your soul. I have known Dane since before I ever pastored a church ( that is over twenty years now), and I can vouch for both his heart and his gifts as a Christian singer. His desire has always been to travel and sing our Lord's praises. His skill to do that, although always of exceptional quality, has now been refined into a blessed gift that all ages can appreciate. His presentation is "down home", and his voice is "sanctified velvet" served with a smile. His sincerity is refreshing, in the light of all of the false and flashy stuff that is out there now, and his work as an auctioneer adds an interesting touch. I wept with his "Can You Forgive Me One More Time?" I laughed with "The Great Mississippi Squirrel Revival." The first thing I did when he was done was to be sure that he was coming back next year! I want to encourage any pastor to let Dane warm their service with his presentation. Dane Bailey ministered to our congregation in concert at the New Paris Missionary Church with the spontaneous joy of the Lord! His commitment to Christ and his genuine desire for the Spirit of God to touch the hearts of the people spiritually through his music came through clearly and enhanced his vocal presentation. He is professional, warm-hearted, ministry oriented, Christ-centered and greatly gifted with a voice of praise. From my heart, I am happy to highly recommend his ministry! His music blessed us greatly. When Dane Bailey called us and said he was going to be in Branson we had never heard of him...so we weren’t entirely sure who he was, what he was like and what kind of singer he was. However, on the strength of a recommendation of a mutual friend we invited Dane to come to The New Country Church...and we are glad we did! Dane was one of God’s surprise blessings. We found him to be warm, personable and genuine. His music ministered to both young and old, and his smooth baritone voice is easy to listen to. We enjoyed him so much that we have just recommended him to all the pastors in the Midwest District of the Missionary Church. Dane Bailey will bless you and your congregation. Wow! What a great voice. I've had nothing but great "reviews". Hope you can come again next August. This guy was a breath of fresh air, which is important for long-winded auctioneers. Our church laughed and cried between his quick wit and powerful testimony. His singing and music selections caused even the most reserved conservative worshipper to tap his toes and clap his hands. Any church that appreciates a southern Gospel sound will really enjoy Dane’s ministry. I, along with BBC wish to THANK YOU for your ministry to us during your outdoor Gospel Concert. It was a reminder to us of the making effective use of our God given opportunities with God’s help as you did. Your willingness to go the EXTRA MILE in ministry is much appreciated. YOU WERE A BLESSING TO MANY. It is all abut the Gospel going local and global! Sharing Jesus is knowing that we give others the only one who can give those things that no one or nothing can take away. I have known Dane Bailey since the early 1980’s. I have had the privilege of watching his ministry for the Lord grow and improve over the years. Dane has a unique ministry of music. He combines some of his auctioneering abilities with music and relates the Gospel message of the Lord to his audiences. His testimony is very much at the forefront of his music ministry. You will sense God’s spirit and receive a wonderful blessing of the Lord through listening to Danes music. I trust that your church or organization will take the opportunity to have Dane minister this message of Christ Jesus to your people. Last Sunday Evening, we had one of the most delightful times in our recent history. We first of all enjoyed a tremendous concert by Dane Bailey, “The Singing Auctioneer” of Ft. Wayne, Indiana. This was our first time for Dane to he with us and I sincerely hope that it will not be the last time. I would recommend “The Singing Auctioneer” to any group who desires to have a good worship experience in music. His sharing of the song “The Touch Of The Master’s Hand” was well worth the whole evening. Further, I would recommend that any group who has Dane Bailey have an auction afterwards. We had a “Pie and Cake Auction” after our concert and it was a tremendous time. We not only sold 30 pies and cakes and made over $350, but the fun and the fellowship, were worth more than money could buy.